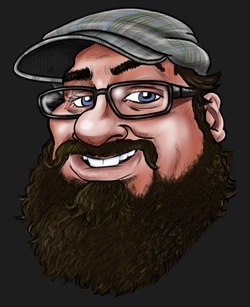 Eddie Renner: Caricatures, illustrations, Storyboards servicing Tampa, St Petersburg and Orlando. So, you say you've always wanted a caricature. Now here you stand, staring over the edge of the abyss asking yourself, “Do I have what it takes?” The courage, the will, the few extra bucks! Don’t make me beg. Just get a sketch and feel good about yourself, knowing you helped feed a starving artist. Seriously, I will send you away with a caricature that will make Matisse look like a kindergartner. So go ahead and have a look around and see what it is I can do for you. Crepitus is an award winning horror film that I wrote and produced.